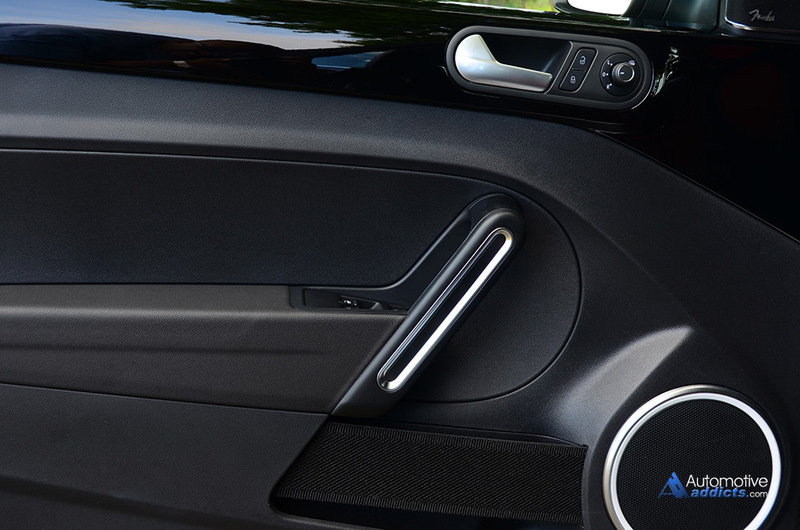 Volkswagen has always surprised me in their relentless efforts to offer something for just about everyone. 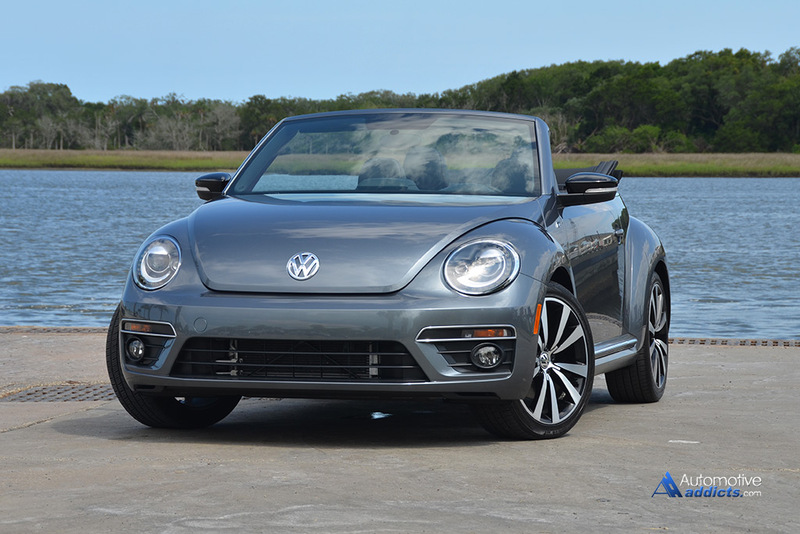 In the area of drop-tops, Volkswagen has a long-standing champion with the satisfying Beetle Convertible, an open top favorite with a nice dash of flaring retro style to the equation. 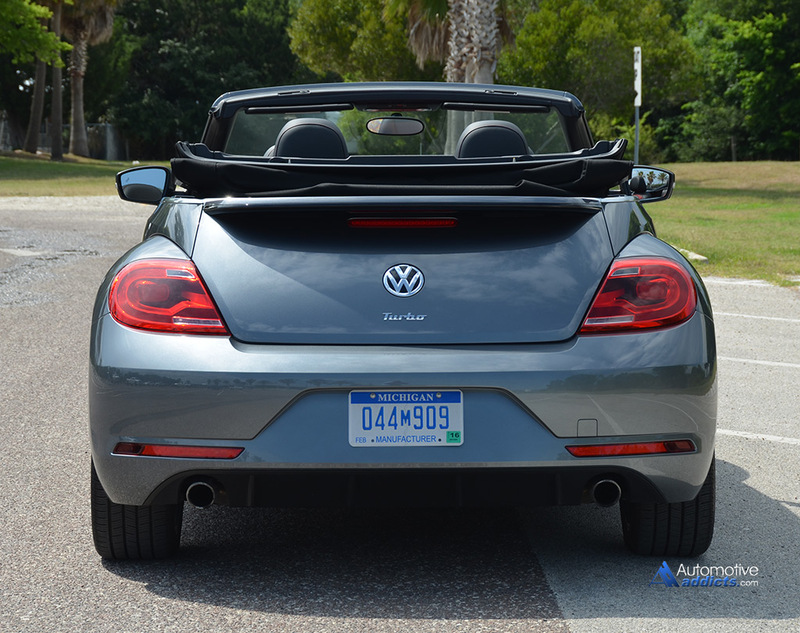 In capturing the essence of the latest Beetle Convertible I had a chance to revisit the R-Line trim for the retro-styled Volkswagen reiterating an aggressive forward-moving momentum in a literal sense with its sporty performance and style. 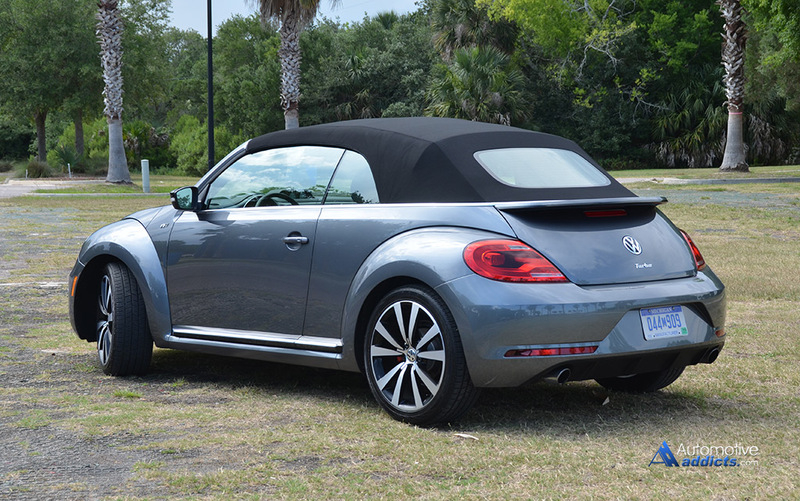 The 2015 Volkswagen Beetle Convertible carries over the newly designed style first introduced as a 2013 model year offering several trims and powertrain options. 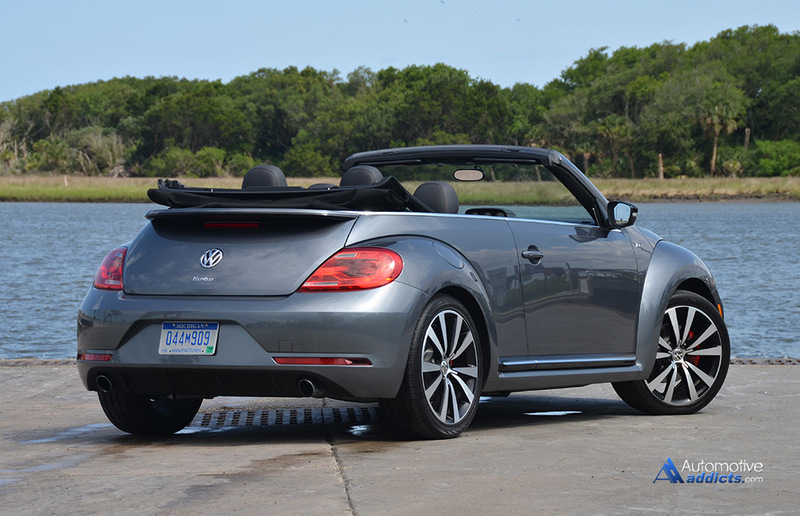 Featuring an efficient yet capable 210 horsepower and 207 lb-ft of torque direct-injection turbocharged 4-cylinder engine mated to a 6-speed DSG automated dual-clutch transmission, the Beetle Convertible R-Line is the performance pinnacle for the model proving to be rather peppy in its steps. 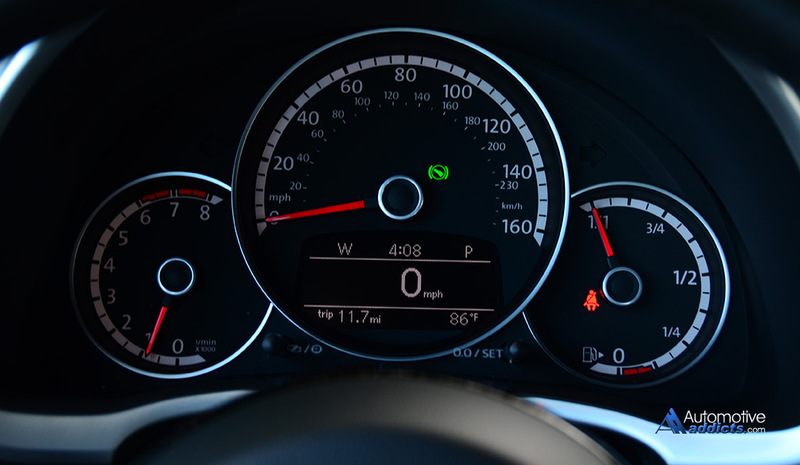 Sixty miles per hour is reached in just 6.7 seconds and the confidence in its handling appeals to light hearted enthusiasts. 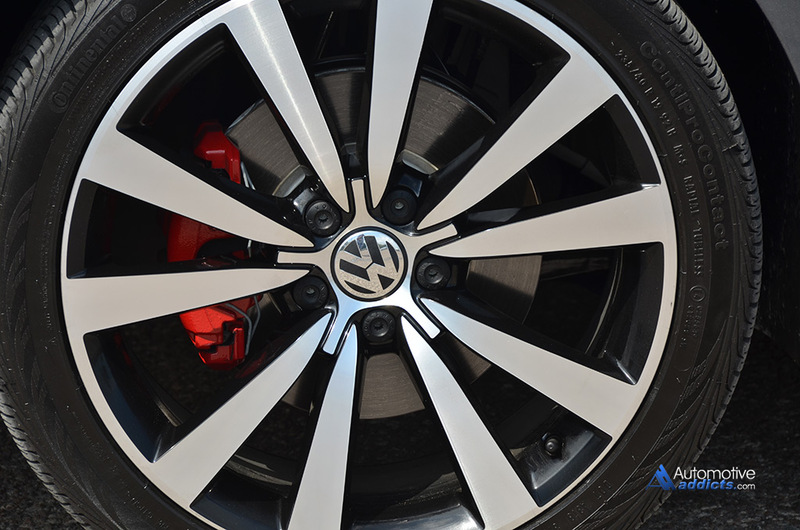 Getting out of the hole may be a mixed bag as the automated clutch of the DSG transmission takes a while to slip and fully engage first gear in addition to turbo lag averting a spirited launch. 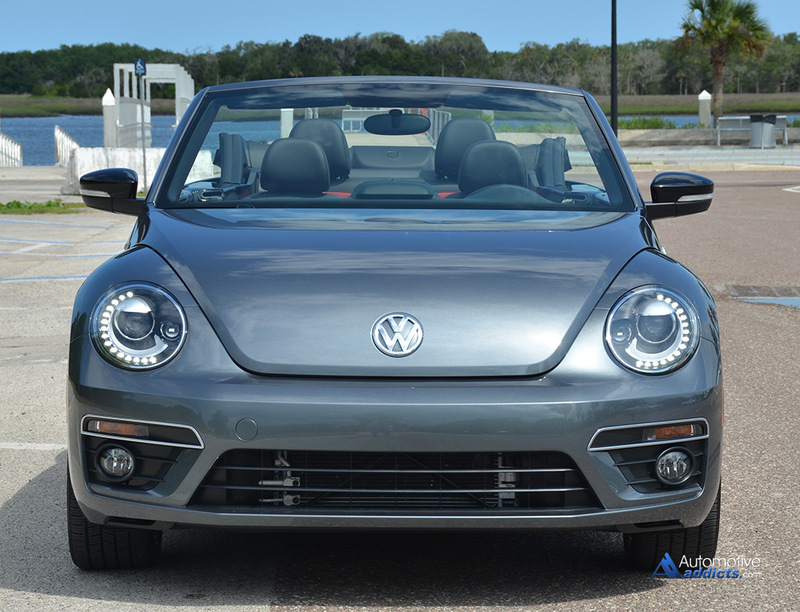 After hitting a few miles per hour, the Beetle Convertible R-Line scoots along with authority slightly breaking the front wheels loose at the mercy of the non- defeatable traction and stability control softly stepping in. 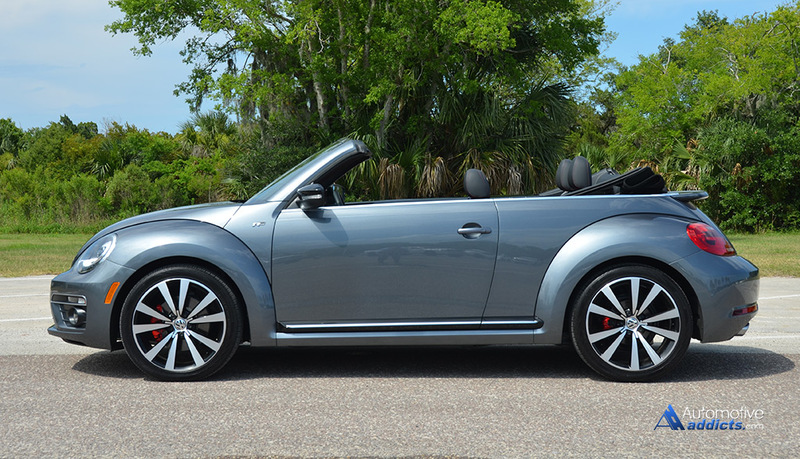 The larger 19-inch alloy wheels and tires do their job to keep the Beetle Convertible planted. 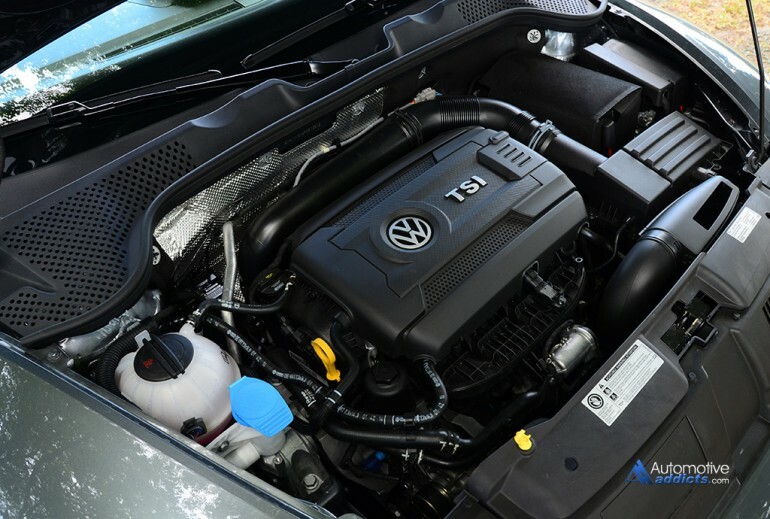 Receiving the designation as a Partial Zero Emissions Vehicle (PZEV), the new Beetle Convertible R-Line has somewhat efficient fuel consumption estimates at 23 mpg city, 29 mpg highway and 25 mpg combined. I saw slightly better numbers during my time with the Beetle Convertible R-Line getting nearly 24 mpg around town and just over 30 mpg on the highway. 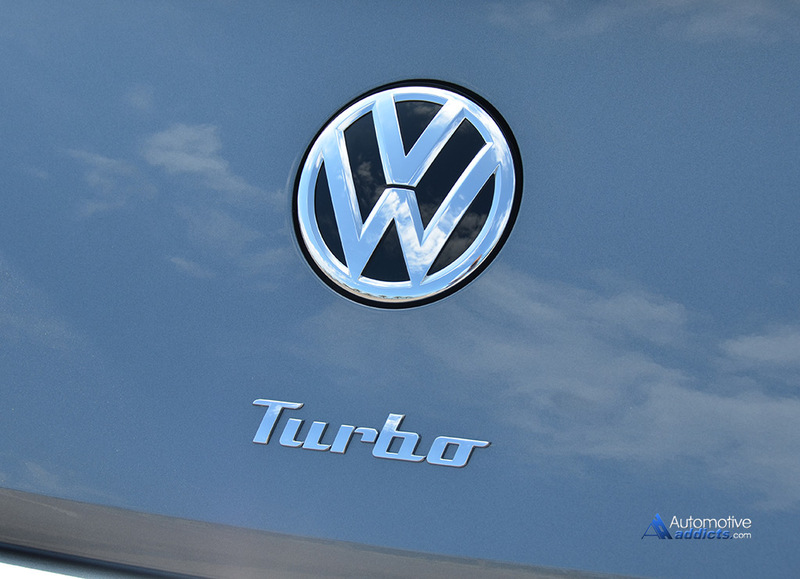 The low-toned grunt and rumble from the 2.0-liter turbo 4-cylinder engine is mostly present at just about any rpm except for idle. 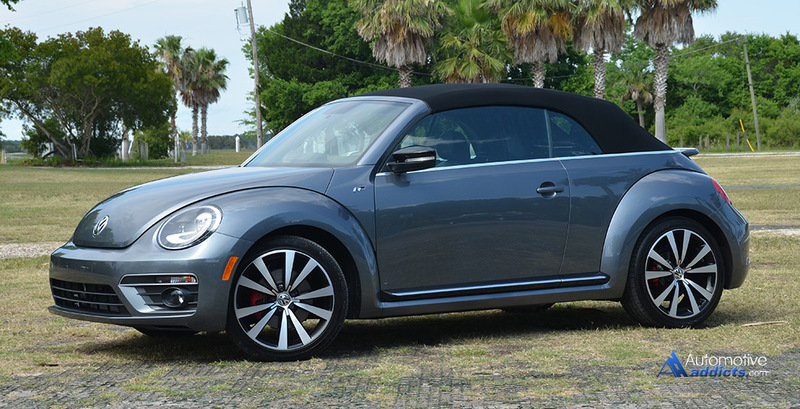 Sounds emitting from the softly purging wastegate make for a pleasant reminder of this turbo Beetle being something more than an economy car. 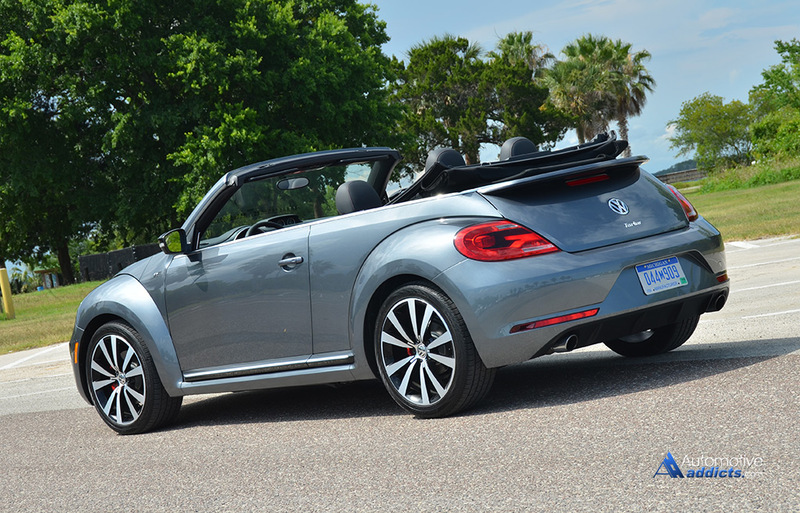 Climbing to highway speeds, the Beetle Convertible R-Line proves to have more than enough oomph to enter into triple digits with ease, while the subtle cowl shake and chassis vibration is a reminder of the drop-top not willing to inspire at such speeds. 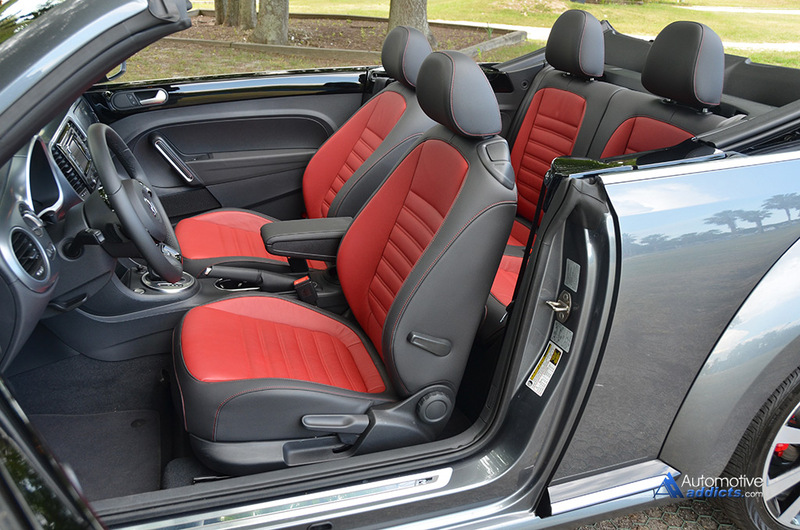 Still, the ride quality and balance of the chassis is agreeable at legal speeds with the top down or up. 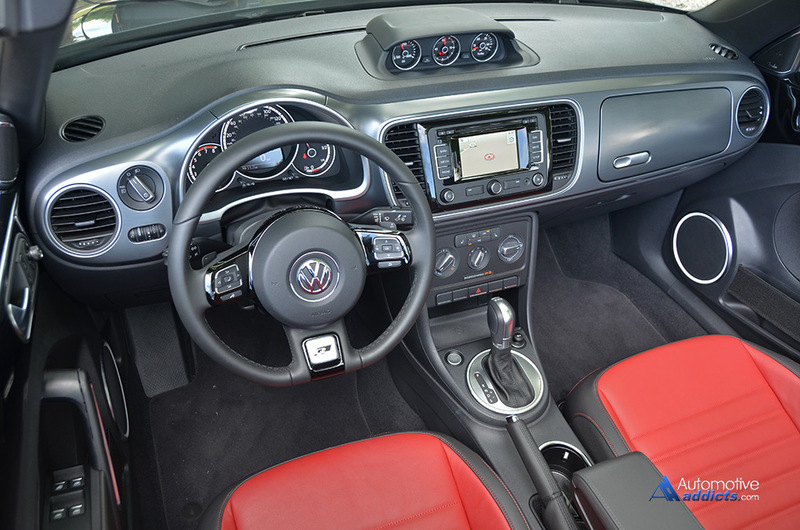 The interior of the Volkswagen Beetle Convertible R-Line has a nice appeal to how it is laid out, even if it is mostly comprised of several hard plastics. 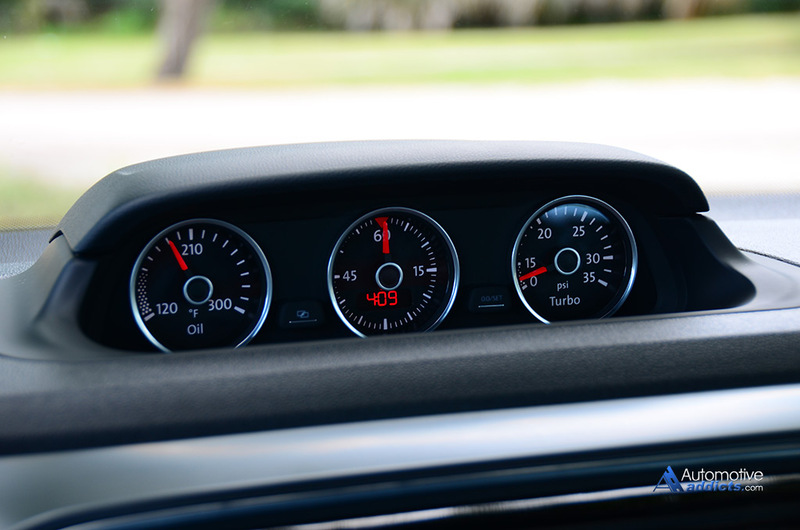 The metallic-finished face of the dashboard has a pleasing aesthetic that makes up for the abundance of hard plastics – as do the supportive and sporty-looking heated red-faced partial leather seats. 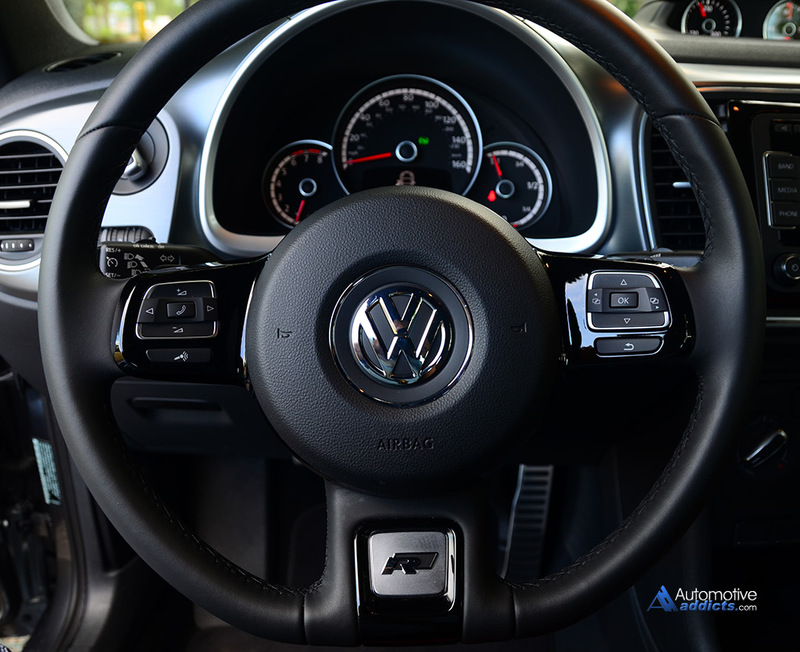 As another sporty trait for the Beetle Convertible R-Line interior, the thin-rimmed leather covered steering wheel features a flat bottom. 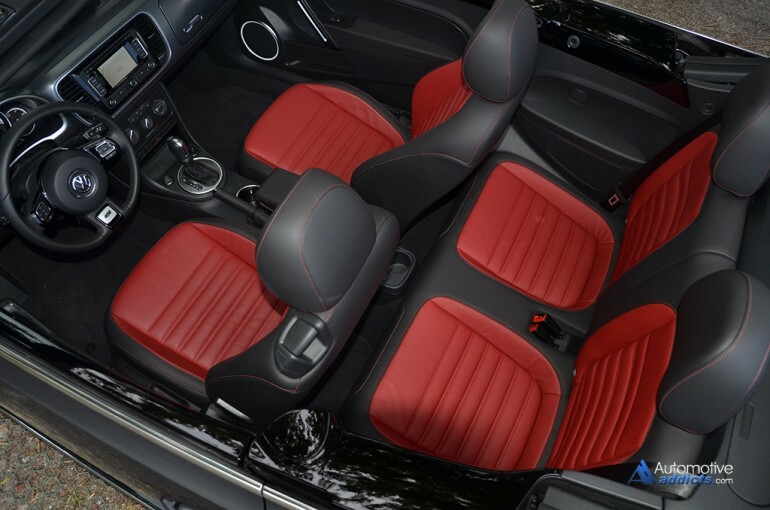 The convertible soft top opens up and closes in a quick one-action succession, but the use of the manually-applied tonneau cover can be a bit cumbersome to install with the payoff only being a sleeker look and less wind noise when the top is folded down. Feature content on the 2015 Volkswagen Beetle Convertible R-Line makes way with a decent list of available options packaged up in the trim level designation. With my Beetle Convertible R-Line having the Sound and Navigation trim, it lands at the top of the trim list having all available options. 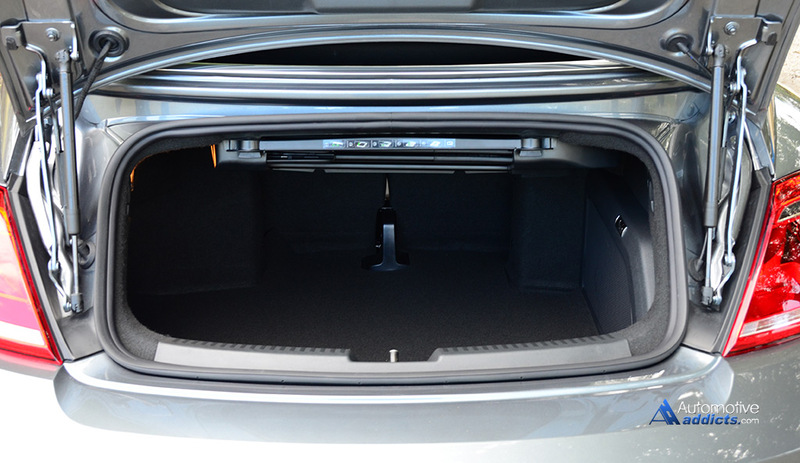 Of those options, it is worthy to mention the unique half-moon LED daytime running lights encased in the large oval Bi-Xenon headlight housing, front fog lights with corner lamps, Bluetooth phone connectivity with streaming audio, an excellent-sounding Fender audio system with 8 speakers and a subwoofer, and a user-friendly navigation system fed through the smallish infotainment 5-inch color LCD touch screen. 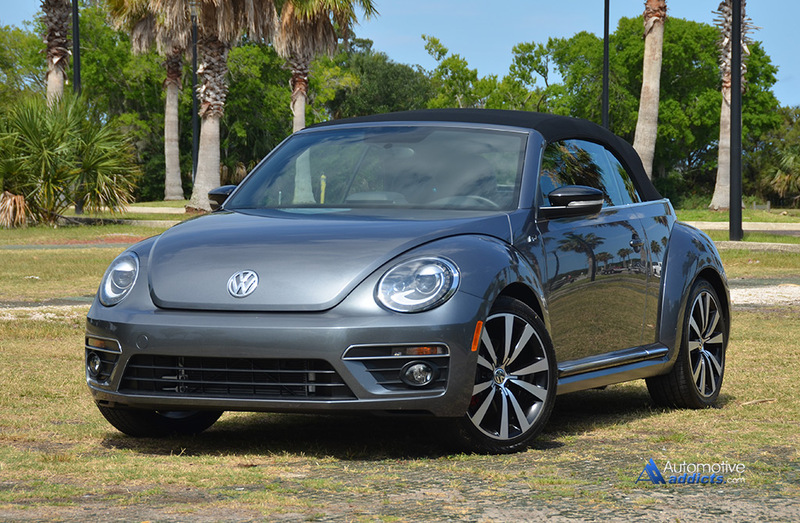 The latest Volkswagen Beetle Convertible R-Line holds its own when it comes to value starting at $29,895 and tallying up to $36,795 including a $820 destination charge for my top-trimmed (loaded) test vehicle.